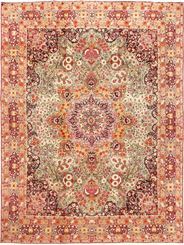 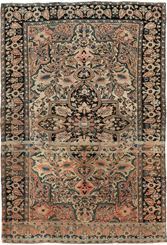 In the 19th century, Mohammad Mohtasham set out to make the finest Persian rugs and carpets in the city of Kashan, Persia. 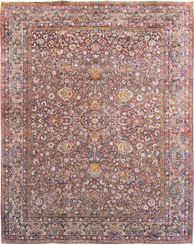 Only the finest wools, silks and natural dyes where used by Mohtasham, making him one of the most famous "master weavers” of his time. 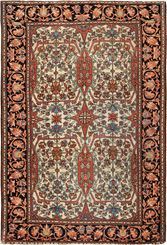 The rectilinear style in the designs stem and range from the early traditions of Persia to the highly decorative attitudes of the West and have been made in sizes ranging from small to mansion. 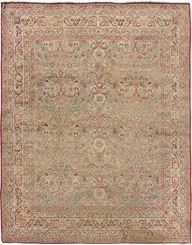 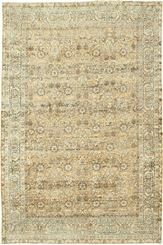 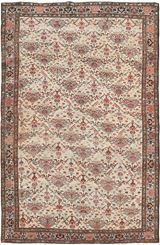 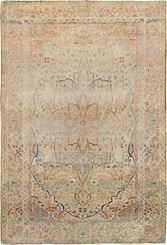 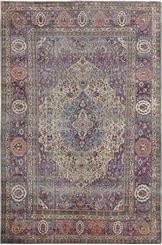 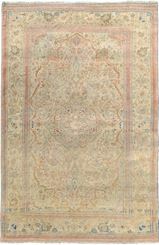 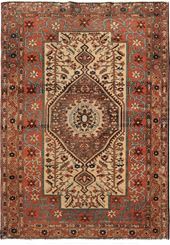 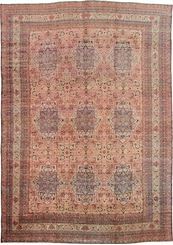 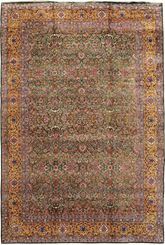 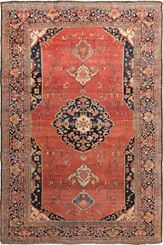 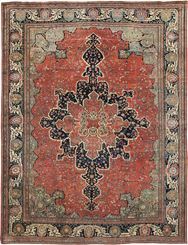 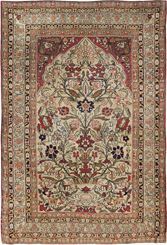 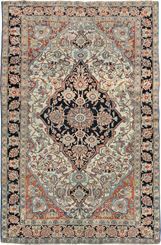 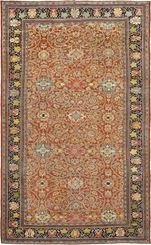 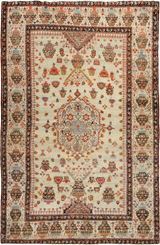 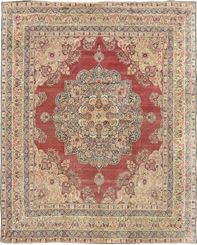 ANTIQUE KERMAN 17' 4" x 24' 0"
ANTIQUE FARAHAN 14' 0" x 20' 10"
ANTIQUE FARAHAN 13' 7" x 20' 0"
ANTIQUE KERMAN 13' 6" x 18' 6"
ANTIQUE LAVAR KERMAN 13' 2" x 19' 6"
ANTIQUE LAVAR KERMAN 11' 5" x 15' 0"
ANTIQUE KERMAN 11' 0" x 14' 6"
ANTIQUE FARAHAN 11' 0" x 14' 0"
ANTIQUE FARAHAN 10' 9" x 17' 7"
ANTIQUE KERMAN 10' 0" x 15' 0"
ANTIQUE LAVAR KERMAN 9'9" X 18'9"
ANTIQUE KERMAN 9'10" X 13'1"
ANTIQUE KHORASSAN 9'6" x 18'7"
ANTIQUE KERMAN 8'9" X 10'10"
ANTIQUE DOROKHSH 8' 9" x 20' 1"
ANTIQUE KERMAN 8' 9" x 11' 0"
ANTIQUE KERMAN 8'8" X 11'9"
ANTIQUE KHORASSAN 8'6" x 11'6"
ANTIQUE KERMAN 8' 5" x 11' 8"
ANTIQUE FARAHAN 8' 4" x 12' 2"
ANTIQUE KERMAN 8' 0" x 9' 6"
ANTIQUE SILK MOHTASHEM KASHAN 7'3" x 10'10"
ANTIQUE KERMAN 7' 0" x 8' 10"
ANTIQUE DOROKHSH 6' 1" x 11' 7"
OLD KERMAN 6' 0" x 9' 0"
ANTIQUE LAVAR KERMAN 4' 6" x 6' 7"
ANTIQUE FARAHAN 4' 6" x 6' 6"
ANTIQUE FARAHAN 4' 6" x 7' 0"
ANTIQUE FARAHAN 4' 5" x 6' 7"
ANTIQUE MOHTASHEM 4' 5" x 6' 7"
ANTIQUE MOHTASHEM 4' 5" x 6' 10"
ANTIQUE KERMAN 4' 4" x 6' 10"
ANTIQUE MOHTASHEM 4' 4" x 6' 3"
ANTIQUE MOHTASHAM 4' 4" x 6' 7"
ANTIQUE FARAHAN 4' 0" x 6' 1"
ANTIQUE SENNEH 3' 9" x 20' 0"
ANTIQUE FARAHAN 3' 6" x 5' 0"
ANTIQUE FARAHAN 3' 4" x 5' 0"
ANTIQUE FARAHAN 3' 4" x 4' 10"
ANTIQUE FARAHAN 3' 0" x 13' 0"